Is there something that is stopping you from reaching your peak, the very best version of yourself? Are you where you want to be? Does your life and career trajectory, feel like it’s stalled a little or even plateaued? 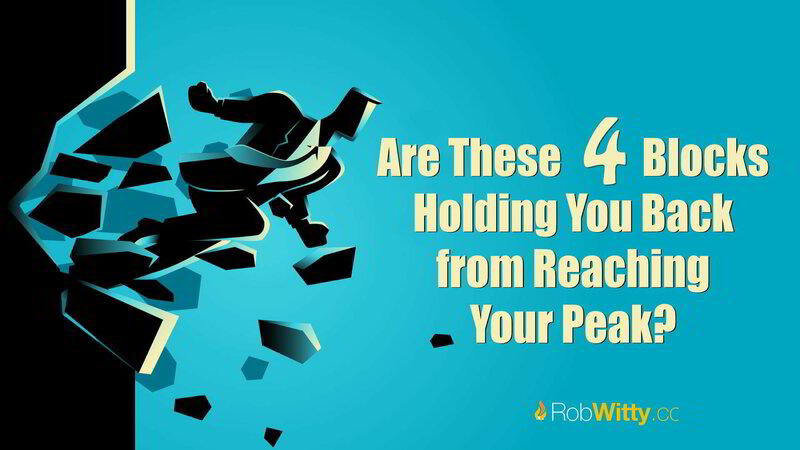 Have a good look at yourself and see if you’re being held back by one or more of these four big things that commonly stop people from reaching their personal best. We all do it. Putting off doing mundane or difficult tasks is all too human. But the longer you delay making that phone call or having that tricky conversation, the worse it’s going to get. You know deep down that you should just do it. The other big area of procrastination is failing to act. How many good ideas have you had, but you haven’t acted on, because you weren’t ready, or you didn’t have the right skills or enough money yet? There will never be the perfect or right time to start a business, launch a project or pitch a new idea. The right time to act is now. And don’t forget: acting on an idea doesn’t mean you leap into the final product straight away. Acting means doing your research, allocating budget, testing the market. If you stop procrastinating and start planning, you’ll be ready for success when it comes. Fear of failure stops you from taking risks and seizing opportunities. It can be paralyzing, but only if you let it. And to free yourself from the fear of failure, you need to what failure means for you. Failure does not mean disaster. It means you haven’t found out what works yet. Edison famously failed to invent the working light bulb more than a thousand times before he hit on the right formula. The converse of failure is persistence. And persistence will out-perform innate talent every time. Staying focused is the key to achieving success. It’s easy to be distracted by side issues and the demands of your email or phone, but staying productive requires attention and focus. Make it easier to produce high-quality, consistent work by keeping focused on the current priorities and sticking to your plan. Self-doubt can undermine all your efforts if you let it. The best thing you can do to build your confidence is to stop comparing yourself to others. Your success story is totally up to you. Look back, see all the stepping stones that brought you to where you are now. You have the skills, and you have the know-how to get where you want to go.